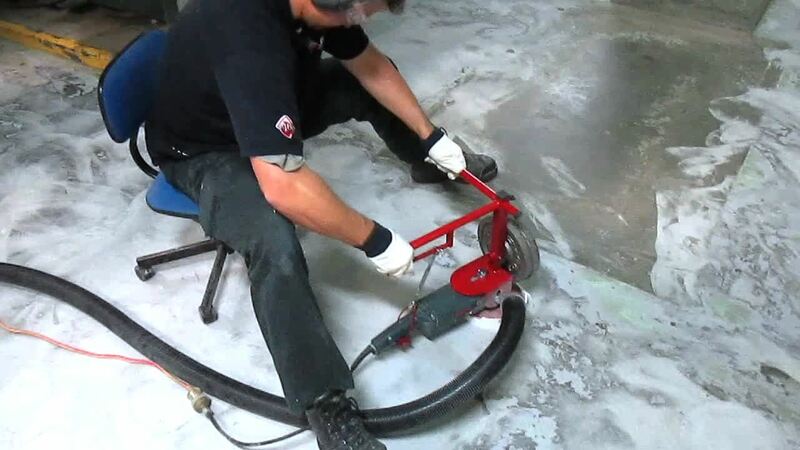 DIY concrete garage floor coating is easy when you know how. 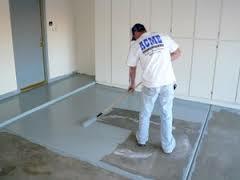 Concrete garage floor coating will last the maximum time and look its best if the concrete floor is open and clean. The concrete garage floor coating will permanently adhere into the top surface with a strong bond if your preparation is excellent and this article will explain how. This is a simple enough process, but care must be exercised to prevent splashing of the acid onto surfaces that are sensitive to it. An acid solution looks like water, but it will stain galvanised iron, aluminium, other concrete and most bare metals. It will also corrode most textiles so protective clothing is essential and working without splashing is critical. a plastic paint roller tray to fit the roller. You should have a water hose handy and a high pressure water jet cleaner. Before concrete garage floor coating open the surface and clean it with acid. Measure the acid and mix it into the water at a ratio of 10 parts water to 1 part acid. Mix a cupful of this first and do tests around the concrete floor to see if it fizzes. If it does not then you may have a clear coating on the concrete which will have to be removed first. You could also try mixing the solution stronger to see if that works – perhaps 2 parts water and 1 part acid. Sometimes this will penetrate a thin sealer. When you are sure it works (fizzes) carefully mix a larger quantity and pour it into the plastic paint tray. Use the long handled, heavy nap roller to gently apply the acid to the concrete floor as evenly as possible over the whole floor without splashing. Gently rinse off all the acid and then water blast the surface thoroughly, preferably with 3,000psi water jet held close to the floor. After it has dried it will be ready for painting. It may be possible to hire a shot blaster to prepare your floor which is excellent for removing old paint. These machines are heavy to transport and can leave deep grooves in concrete if they are not used properly. It is better to pay a contractor to do this for you. Diamond grinding to prepare for concrete garage floor coating is easier than shot blasting and less costly to hire. It will open the surface and clean off coatings and dirt at the same time. The grinding wheel should be used flat at all times and moved in a circular motion to prevent grinding marks (shoulders, tool marks). The surface can be ground down to the aggregate or just through the top surface. For coating it is preferable to grind thoroughly and lightly. Vacuum the floor with a floor wand to remove all the dust before coating. These are the common enamel paint products found in paint stores for floor coating. They are high gloss, coloured, solvent based and wear better than house paint. For foot traffic they will last for 18 mths to 3 yrs depending on wear. They are relatively inexpensive, easy to apply and will withstand vehicle traffic as long as the preparation is excellent. These products are generally thinner than the above paints, they can be solvent or water based, but they can wear better depending on formulation. Most acrylics are clear although some are coloured, they are more flexible than alkyds and have a lower gloss level. Urethanes are industrial strength, hard wearing like epoxies and are mostly available as clear coatings. They are a chemically cured product like epoxy except that they use moisture in the air for the chemical cure instead of a part B. You will need breathing protection while applying these and they can be purchased as a UV stable product that will not yellow like epoxy although these are often twice the cost of non UV stable urethanes. Their gloss level is excellent and they are easy to apply in thin layers with very good wearing characteristics. Most epoxies are coloured and non UV stable so they will discolour where they are exposed to the sun such as at entrances and areas that extend outside the door. These are strong, hard-wearing products with a thick film build and come in a variety of solids contents. A 50% solids content epoxy will give you a pot life of a few hours, but the thickness of the final product will be half the wet film thickness that you apply. A 100% solids epoxy will cure at the same wet film thickness with a short pot life of 20 minutes, meaning that you only have that amount of time to apply it to the floor once it is mixed. Epoxy coatings must be mixed thoroughly for a few minutes with a power mixer to force the A and B components to mix together. Only mix what you can comfortably apply within 15 minutes, then mix again. You may have to change roller covers too. Fast cure, same day coatings are possible with polyurea and polyaspartic coatings in almost any temperature especially in cold climates due to the variations available in formula to adjust the curing speed. These are long-lasting quality coatings and can be roller applied or sprayed on one day and driven on the next. Google search for suppliers and applicators on the internet because these require experience to apply.